I had intended to write a nice article showing a concrete example of learning tests in action, then something wonderful happened: all the code disappeared. I love Typeform, especially because it integrates with Stripe for processing payments. Sadly, Typeform does not allow my customer to pay-what-they-think-it-was-worth unless I anchor them by presenting a handful of price options, similar to what you see here. Not the way I want to let my customers choose the amount they wish to pay. How many buttons should I give them? After reviewing my options, I settled on letting a customer enter the amount they want to pay in a Typeform form, which will send an email to a custom application that responds with a link to a Stripe checkout form for the amount they chose. It feels a little convoluted, but it will work. I know how to create the Stripe checkout and I know how to create the Typeform form, but I have not handled incoming email with Ruby and Sinatra and Heroku before, so I need to learn that. After writing code (and documenting what I did so that I could publish it for you to read), I found out that I didn’t need to do any of it. Instead, I could use existing tools to learn what I needed to know. 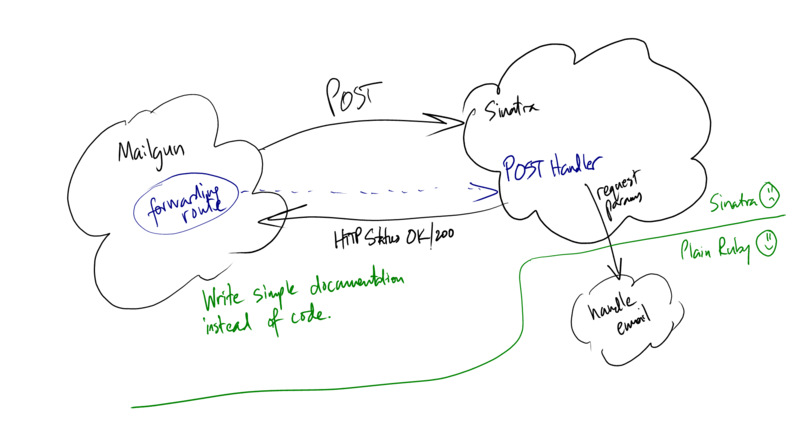 Specifically, I needed to know the format of what Mailgun will forward to my Sinatra application’s POST handler. In reading Mailgun’s REST API documentation, I discovered a wonderful tool: http://bin.mailgun.net/.1 When you visit bin.mailgun.net, you receive a URL to which you can send requests and see the results all nicely formatted for you. 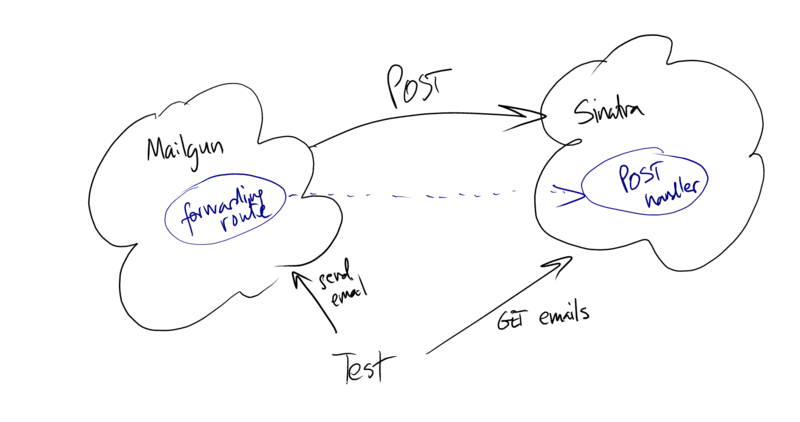 With this, I have documentation of one half of the contract between Mailgun and my Sinatra application, namely the contents of the POST request representing the incoming email, but what about the contract of the response? I found this in the documentation. If Mailgun receives a 200 (Success) code it will determine the webhook POST is successful and not retry. If Mailgun receives a 406 (Not Acceptable) code, Mailgun will determine the POST is rejected and not retry. For any other code, Mailgun will retry POSTing according to the schedule below for Webhooks other than the delivery notification. If your application is unable to process the webhook request but you do not return a 406 error code, Mailgun will retry (other than for delivery notification) during 8 hours at the following intervals before stop trying: 10 minutes, 10 minutes, 15 minutes, 30 minutes, 1 hour, 2 hour and 4 hours. I loves me some Plain Ruby! Uh… Where Are the Learning Tests? I ran them manually. I suppose I could have automated them, but I don’t see the value. If I notice behavior that seems not to conform to the contract I’ve discovered here today, then I’ll fire up RSpec; for now, this will do.